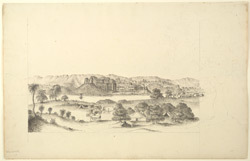 Pencil and ink drawing of Maheshwar across the river by Sir James Abbott (1807-1896) in 1841. Maheshwar, situated on the north bank of the Narmada, has been identified as Mahishmati, the ancient capital of King Kartivirarjun, a spectacular temple city mentioned in the Ramayana and Mahabharata epics. The Holkar Queen Rani Ahilyabai of Indore (died 1795) was responsible for revitalizing the city by building a temple and fort complex here. The fort is situated on an isolated hill next to the city.